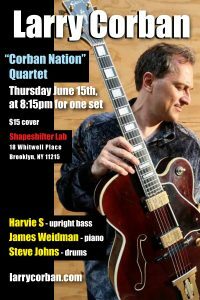 Larry Corban “Corban Nation” Quartet at ShapeShifter on June 15th at 8:15 for One Set!! 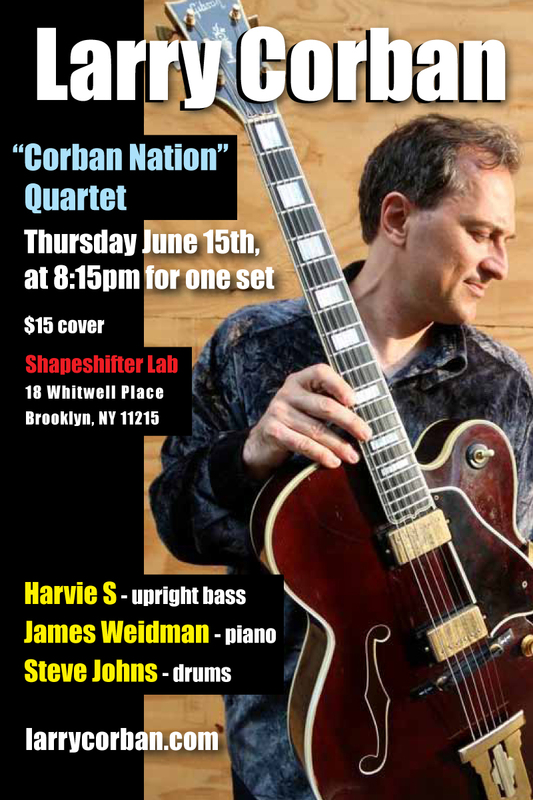 This entry was posted in Guitar Code, LIve Music, Radio Campaign, Records, Reviews and tagged #contemporaryfusion, #corbannation, #corbannationcd, #fusionguitar, #harvies, #harviesbass, #instrumentalguitar, #jamesweidman, #jazz guitar, #jazzfusionguitar, #jazzguitar, #karionproductions, #larrycorban, #larrycorbanguitar, #larryjazz, #Live Jazz, #Live Music, #livejazz, #livemusic, #mainstreamjazz, #newyorkcityjazz, #NYC jazz guitar, #nycfrighteningguitar, #nycguitar, #nycjazzfusionguitar, #nycjazzguitar, #NYjazz guitar, #shredjazzguitar. Bookmark the permalink.